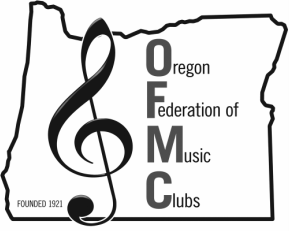 Welcome to the Oregon Federation of Music Clubs! The Oregon Federation of Music Clubs was founded in 1921 as part of the National Federation of Music Clubs. Our organization is dedicated to finding and encouraging musical talent through annual Federated Music Festivals and the awarding of scholarships in piano, strings, harp and voice. ​ We welcome teachers, performers and music lovers to join. The OFMC is all about coming together to enjoy music -- and getting rewarded for performing! Check out the Calendar to find the date of the next Festival, and learn about our available Awards here. OFMC Competative Scholarship Event: November 18, 2017. 9 AM to 3:00 PM at Classic Pianos, Portland. Registration has closed for this event. Auditions are open to the public. We look forward to having you join us -- We are currently 266 members strong, representing over 3500 Juniors! Click here to learn how to be a part of our organization. Congratulations to our 2018 Festival Grand Cup Recipients! ​From a young age, Lydia Khaw had a fascination with learning to play musical instruments. At three years old, following in her three older siblings’ footsteps, she began taking piano lessons from a friend and music teacher, Jill Gambill. Watching her older siblings accelerate in their musical talents gave her strong motivation to continue practicing music. In the year 2005, Lydia participated in her first piano festival in Portland, Oregon at the age of three. Since then, with the encouragement and support of her teacher and family, she has continued playing piano solos in the National Federation of Music Clubs’ annual festivals. Recently, in 2016, Lydia began performing concertos for Festival as well. By next year, in 2019, she plans to continue gaining points in hopes of achieving the 6th President's Cup. Furthermore, she has taken part in Oregon Music Teachers Association Syllabus and continues to work towards finishing Level X, the final and most difficult level. Over the years, her joy of piano eventually led to learning more musical instruments, including drums and flute. Besides practicing for musical competitions, Lydia also enjoys playing her favorite pop pieces on the flute and piano. Lydia accredits her passion for playing music to her family, and teacher, Jill Gambill, who continue to support and encourage her throughout her ongoing musical challenges. ​Maggie Bick has been playing in Junior Festivals for eleven years. She has been studying with Barbara Berg, NCTM, and is currently studying with Pauline Eidemiller, NCTM. Maggie recently completed Oregon Music Teacher Associon’s Extended Study of Musicianship and Repertoire program, (ESMAR) and is now focused on completing the Syllabus program. Aside from her formal studies at the piano, she enjoys accompanying her school choir. Maggie is also focused on becoming fluent in Spanish. She is looking to study International Studies or Economics in college and hopes to utilize her second language. As well, she intends on minoring in music to continue a formal study at the piano. Maggie is looking forward to another year of Junior Festival and applying the knowledge she will gain from the adjudication. feels blessed to be a part of such a great program.